flashy picture to catch your attention. 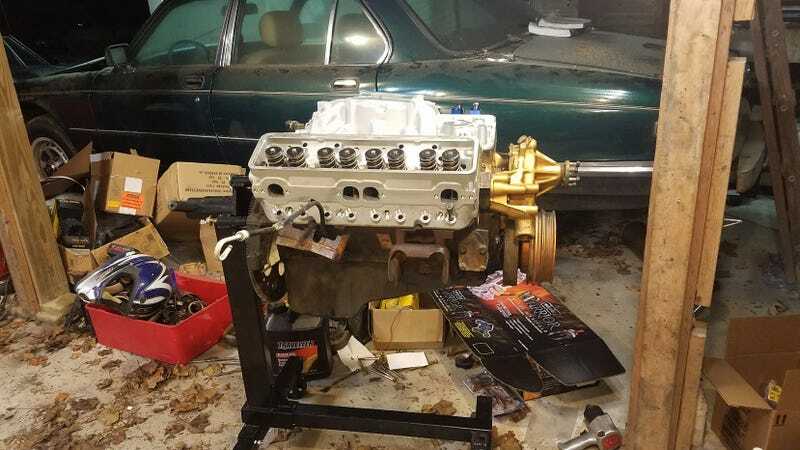 I got most of the 350 dissembled, 7 of the 8 pistons are out and a few lifters are lightly stuck in the block but other than that everything went smoothly. I was even able to remove the harmonic balancer with a breaker bar. The bearings seem ok-ish, this engine was a “20 thousand mile” engine when i bought it, the caveat being that it was all farm miles. So basically the oil’s never been changed or any maintenance done to it. Hopefully tomorrow I can get the last piston out and hone the cylinders to get the surface rust out. Then I guess it’s new rotating assembly time, I’m shooting for about 10-10.5:1 compression and 300 at the wheels which should be very easy to accomplish.